Fallsburg’s Kenny Jaycox runs upfield to score a 27-yard touchdown in the fourth quarter of Saturday night’s game against Millbrook. 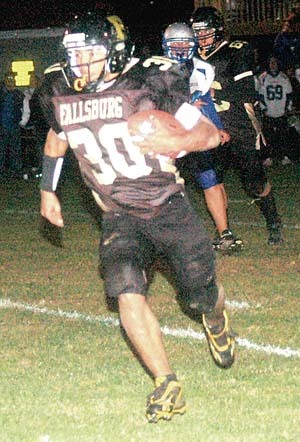 FALLSBURG  October 12, 2010  The visiting Millbrook Blazers jumped out to a 30-7 lead over the Fallsburg Comets in the first quarter of Saturday night’s Class C, Division II football game at Fallsburg’s Morningside Park. Millbrook (6-0, 2-0 Div. II) went on to post a 58-35 win. But the hometown fans will remember the contest for one in which the Comets played with a great deal of heart and determination  especially in the second half, when they scored a touchdown in the third quarter and registered three more TDs in the fourth quarter. Down 44-7 in the third quarter, Fallsburg’s Corey McKeon recovered a fumble at the Millbrook 42. Four plays later, Kenny Jaycox ran for a 10-yard touchdown with 4:34 to go in the quarter. Millbrook’s James Ross ran the ensuing kickoff back 90 yards for a touchdown to push his team’s lead to 51-13. But Fallsburg (0-6, 0-2 Div. II) responded by continuing to give a great effort. With 4:28 remaining in the fourth quarter, Jaycox scored on a 45-yard run. Quarterback Jimmy Bertholf then ran for the two-point conversion to make it a 51-21 game. The Blazers fumbled the ball their subsequent possession and the Comets recovered at the Millbrook 27. Fallsburg wasted little time in converting the turnover into points. On first down, Jaycox swept left, turned the corner and ran for a 27-yard touchdown. Sebastian Sanchez ran for the two-point conversion as the Comets closed their deficit to 51-29. The Comets then recovered another Blazers’ fumble. Fallsburg quickly scored again as Jaycox ran for a 40-yard TD. The score made it a two-possession game as the Comets trailed, 51-35. But Ross returned the following kickoff 85 yards for a touchdown to seal the Blazers’ 58-35 victory. Ross and Taylor Galano led the Millbrook attack. In addition to his 220 yards on special teams and those two kickoff returns for TDs, Ross carried the ball six times for 123 yards and three touchdowns. Galano had touchdown catches of 49 yards and 38 yards. He also scored on a 75-yard interception return. Quarterback Jonathan Crane completed 5 of 11 passes for 117 yards and two TDs. Keenan was very impressed by the Comets. Jaycox finished the evening with 428 all-purpose yards. He ran the ball 12 times for 203 yards and three TDs and had 201 yards on returns, including a 93-yard kickoff return for a touchdown in the first quarter which put the Comets on the scoreboard. Jaycox also caught two passes for 24 yards. Bertholf completed 7 of 14 passes for 111 yards and one interception. McKeon and Bertholf paced the Fallsburg defense with five tackles apiece. Teammate Kristopher Williams made four tackles. Ramirez also praised the Blazers.